The use of sales letters had been around for as long as direct response marketing have been practiced in the conventional brick and mortar world. And ever since the Berlin wall came down and the World Wide Web came up, it did not take long for people from business backgrounds to tap into the growing world of E-Commerce. And it certainly didnt take long for direct response marketers to carry their offline practice into the online world. Thus, you see the practice of one-page-long sales letters being used widely today by businesses of various sizes to sell and push their products and/or services into the Internet marketplace. This is the case, because sales letters in this fashion have been proven to be all time-tested. As you probably know by now, sales letters are really just one LONG page with one person in mind: to help sell the product to the prospect. Its like an electronic salesperson on your behalf, and it certainly beats having you to prospect and sell to someone else face-to-face or gamble on sending out hard copy mails (that can span 5-20 pages long when printed) and face the chance of not covering your investment on printing back. A sales letter is considered to produce a good decent conversion rate at 2 to 4 percent. You are doing better if your sales letter produces above 4 percent. Some marketers reportedly produce 6 and some as high as 20-30 to cold prospects! Believe it or not, online sales letter consists of mainly the use of mostly words and then some images. And words are indeed powerful tools; you should consider them double-edged swords. If used correctly, words can sell literally. If used improperly, not only would your sales letter suffer in conversion rate, it might just deliver the wrong message and the worse case scenario can be that of offending your prospects (besides not closing the sale). I have a sneaky suspicion that your sales letters are currently not producing the kind of conversion rates you want. Or this is your first try at developing a life long asset or skill where marketing online is concerned. Perhaps you want to seek all ways possible to offer your sales copies a boost without having to spend a fortune on expensive copywriters in the process because you dont have the deep pockets for it at the moment. Regardless of your current needs, I trust that you will find this guide useful and that when you apply these tips into your sales copies, you will see substantial results in your conversion rates. ? 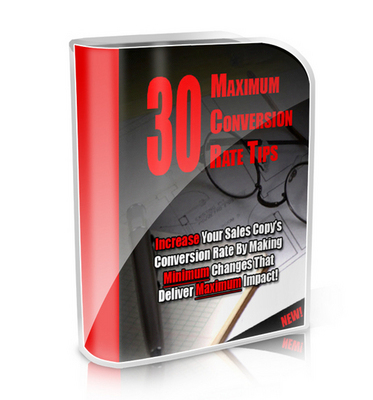 Read on and discover how tips you can use to MAXIMIZE your conversion rates by making MINIMUM changes and additions to your current sales copies!